misery depends upon our dispositions and not upon our circumstances." 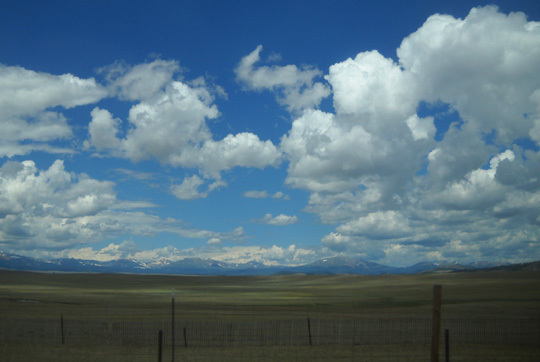 Today's we had a leisurely drive west of here to Leadville, Colorado, on of our favorite places to hang out at high altitude where it's cooler in the summer. It was a pretty day after yesterday's storms -- temperature in the low 60s F., some clouds but mostly sunny. 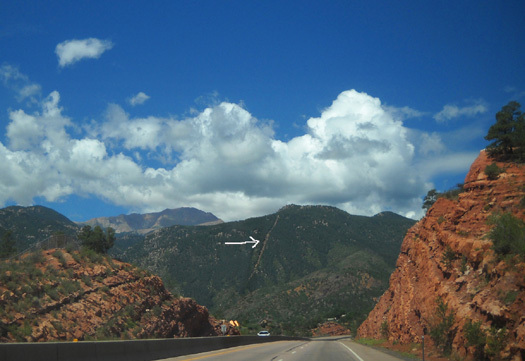 an abandoned section of the cog railway that goes to the summit of Pike's Peak, which is in the background. 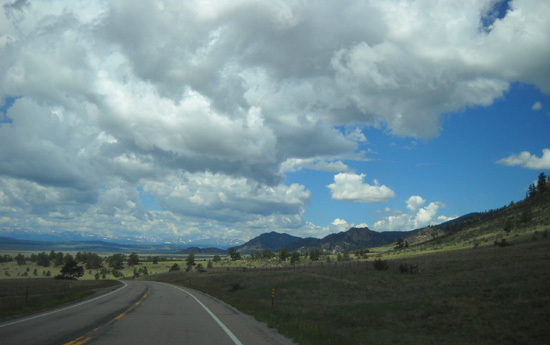 We had two basic choices for routes since we were leaving from the north side of Colorado Springs. 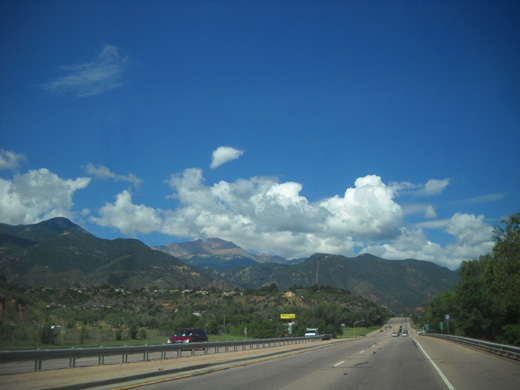 The first was to go north on I-25 to I-470 and I-70 west and down CO 91 to Leadville. That route is longer but probably faster with all the freeway miles. However, we'd have metro Denver traffic to deal with and two 11,000+ foot passes to climb and descend. 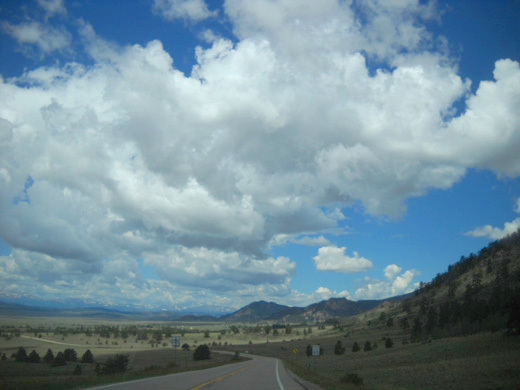 We chose the more scenic route with less traffic and several lower passes -- south on I-25 through the Springs to US 24 west and north. That way was 141 miles and took us three hours with one stop along the way. 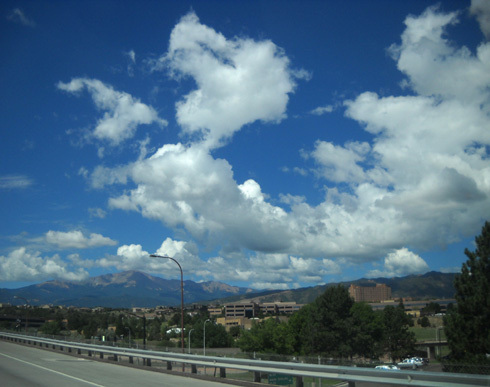 US 24 is fairly slow through the western part of Colorado Springs and as it winds around the north side of Pike's Peak. 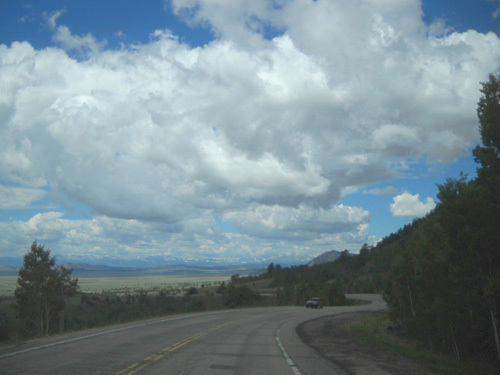 It remains four-lane through the towns of Cascade and Woodland Park, then becomes mostly two-lane the rest of the way to Buena Vista and north to Leadville, where it runs contiguously with US 285 for a while. It's a hilly road but you can drive pretty fast if you want. The pavement is smooth and we didn't run into any construction today. 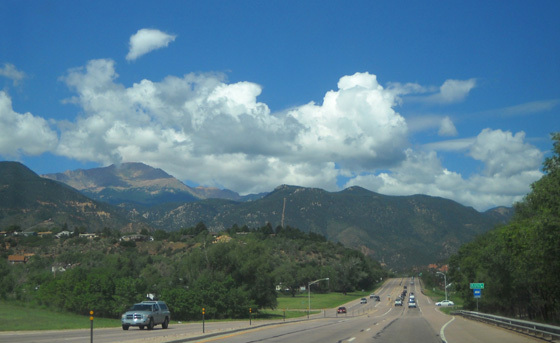 Traffic in Colorado Springs doesn't begin to compare with Denver, fortunately (that's a compliment to Colorado Springs). By leaving late in the morning we missed rush hour. 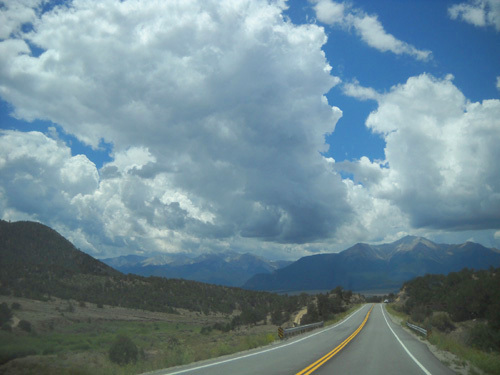 There wasn't much traffic at all through the mountains and broad valleys between Woodland Park and Antero Jct. 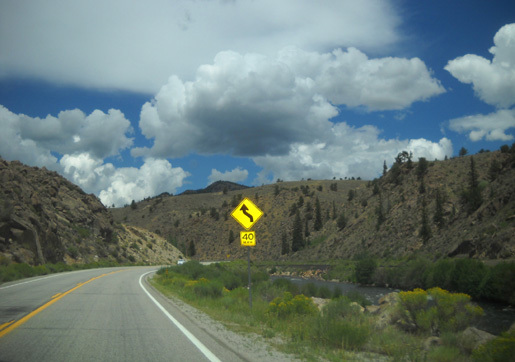 where US 285 joined US 24. Traffic was a little heavier from the junction to and through Buena Vista and on up to Leadville. The weather was mostly good the whole way. 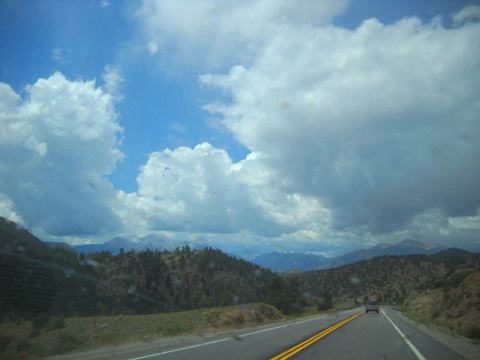 We could see some storms over the mountains that form the Continental Divide to the north and west of us but we got only a little bit of rain where we were. 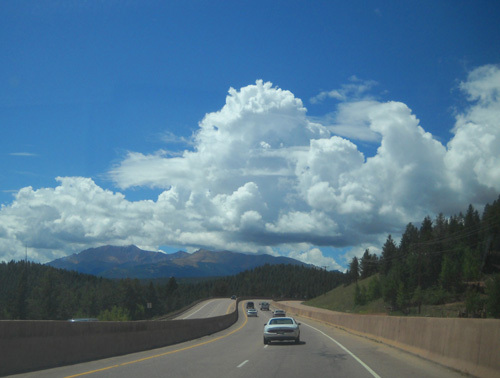 The scenery is simply fantastic in either direction on this road and today I was also fascinated by all the clouds:. Going westbound you can see the Continental Divide to the north, then west. The broad South Park valley and other range and forest lands are very green now. 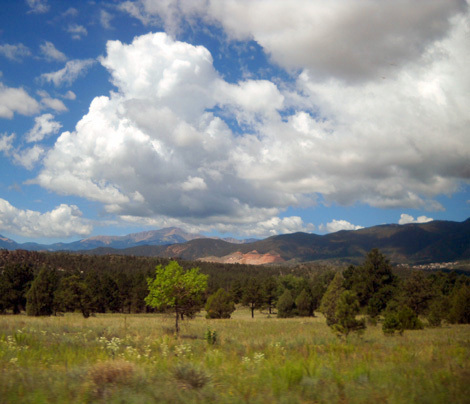 This part of Colorado doesn�t look like it�s in a drought, nor does Leadville. 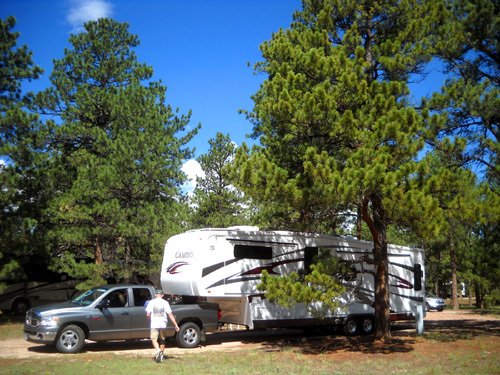 We saw a range of diesel prices from $3.76/gallon in Colorado Springs and Woodland Park to $4.19 in one little isolated town along the way. The price in Leadville where we will get fuel is $3.84. That's still plenty high but lower than we expected. We arrived at our friend Jack's home construction office, which is really a nice house he built to serve as his office for several years, on McWethy Dr. about 2 PM. 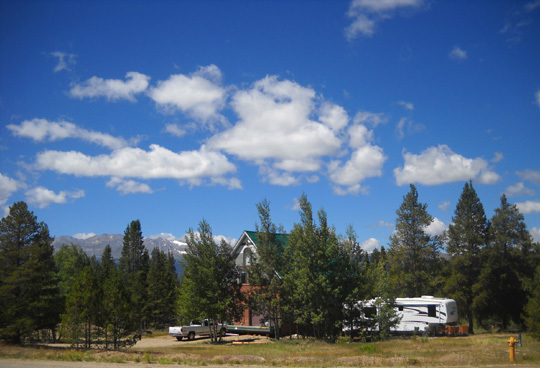 We�ve stayed here many times over the past eight or nine years. It looked like it would pour down rain any time, but we didn�t get all that much through the afternoon and evening. Temps were in the upper 60s F.
Jack is in Canada on business for a few days. We called him this morning to make sure it was OK to arrive a few days early. He was fine with that and told us to just park in the same place we did last year. He would like to build several houses on the acres he owns around the office/house but the economic recession has gotten in the way of the project the past five or six years. That's bad for him but good for us, because he continues to let us park temporarily on the land while it's still vacant. We have water, 20-amp electricity, protection from the wind, some shade, a scenic view of the two highest mountains in Colorado from the yard, a near front-row seat for the bike and foot races, a paved, 13-mile multi-use path a couple hundred feet away, and very nice neighbors inside the house. Jack's gone temporarily but a cardiologist named Bill is staying inside the house/office for a couple weeks. Jim talked to him for a few minutes to let him know that it's OK for us to be here, too. 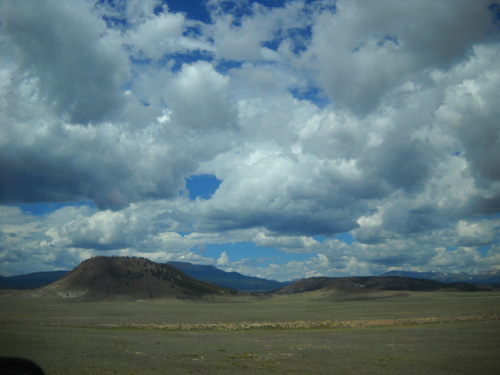 Bill's here to acclimate and train for the LT100 bike race, the first time he�s ridden it. The house has several bedrooms and guests often stay here in the summer. Jack�s daughter was in and out today, too. She welcomed us back again like we are family. 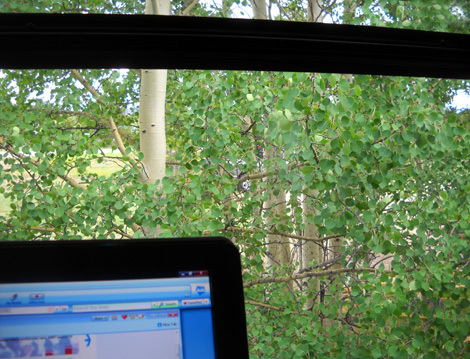 The view out my desk window is forest-y. We have a good phone and internet connection. We're using our MiFi again now; it was nice to save our gigabytes for more than half a month at the Academy when we had free WiFi. The only thing Jim misses is TV. We can�t get any stations here without a satellite dish. I'm OK with the silence for a while; I don't watch much TV in the summer and I get most of my news from various sources online. 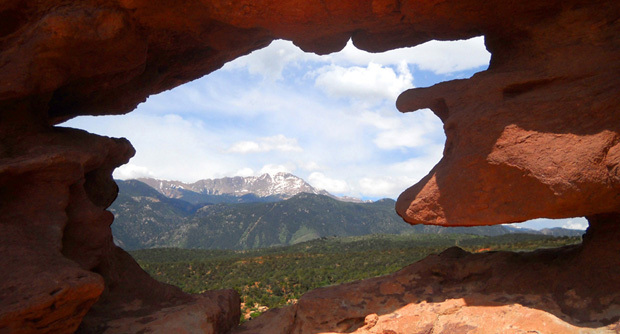 We're looking forward to seeing friends at the LT100 bike and foot races and getting out on some bike paths and mountain trails while we're here. Stay tuned for lots of stories and photos from Leadville.